In the past few decades, many politicians have propagated the idea of “running government like a business” in order to cut spending and reduce the debt—this concept is fundamentally wrong due to the facts that governments and corporations have diametrically opposed goals and operate in entirely different manners. The purpose of government is to provide for the common defense, ensure the rule of law and to advance the common good. Some services (ex. police/fire protection) are necessary for society to function and are incompatible with the private sector because of fairness issues and the free rider problem; these services are seen as fundamentals that should be provided to everybody regardless of the ability to pay. The military serves to ensure the populace’s safety from external threats such as invasion or terrorism; domestic law enforcement organizations, fire protection and emergency services are all vital services that the government provides in order to ensure the rule of law and general safety inside of a country. Industrial/banking regulations, public education, government grants for research, and the national infrastructure are government run programs intended to provide for the common good of society as a whole. The government exists to serve society through preserving order and providing services that cannot be effectively and equitably provided by the private sector. Governments are akin to beehives, where there are numerous smaller parts that exist in order to assist the society as a whole, regardless of whether there is a benefit to the part. The purpose of a vast majority of corporations is to make a profit for its investors. Corporations that do not have a profit motive are considered non-profits and often exist to advocate social causes or perform charity work. Regardless of how a business makes money—whether it sells retail goods, develops new products, or provides services to consumers—it exists purely for the profit of those who own it. There is no requirement that a corporation provide services to those who cannot afford them, nor is there a requirement for a business to increase the public good. By cutting costs and more efficiently producing goods or performing services, a business competes with others and eventually grows larger. Corporations resemble amoebas in that they are shapeless, amoral masses that exist only to feed, grow, and consume other, smaller, entities in competition for scarce resources. The fundamental flaws in the ideal that government can be run like a business are the amoral nature of corporations and the massive free-rider problems inherent to society. The most basic flaw in ideal of a government run like a business is the absolute disconnect in goals between governments and businesses. Corporations need to pay their workers enough to entice them to work, but they are not obligated to work to improve their worker’ well-being Governments exist for the sole purpose to serve their citizens’ interests. This fundamental disconnect means that while government can be run in a business model to minimize costs, services to those who are disadvantaged will inevitably be cut. By cutting services in an attempt to increase efficiency, equality inevitably suffers and the core ideal of government as a protector of all citizens is lost. The educational system illustrates an example of the goals disconnect problem inherent to government run like a business: A corporate outlook into public services leads to decreased costs, but also massive decreases in quality. Cost cutting measures in public schools, such as reducing teacher compensation or decreasing supplies available to students, may reduce the overall price of education but they also damage the quality of the service. Unfortunately, many citizens cannot afford private schools, thus they cannot find alternative education in a market and are stuck with a sub-par education. Our country’s education system, like many other public services, will suffer greatly when the profit motive eclipses the service itself as the goal of the program. The goal of education should be education, not turning a profit by supplying defective services to those who are unable to attain alternative educations in the name of saving money. The organizations intended to work to preserve social order, such as police and prisons are areas where the profit motive becomes very dangerous to society. When police forces and our legal system become profit oriented, justice takes a backseat to money. A profit driven police force will hand out excessive fines and unnecessary charges in order to increase its own bottom line. We already see this problem in local police departments that are funded by fines: when the police run low on funds, the number of fines as well as the harshness of the fines increases as the police attempt to make up for lost funding. While this is only a minor example, it demonstrates just how dangerous adding the profit motive to the justice systems can become. The private prisons in the USA are an example of where the profit motive has already taken over a public service. Private prisons are paid by the government to house prisoners just as publicly run prisons do; the major differences are that the private prisons are not legally as culpable for abuses of inmates, and they have an incentive to get more people locked up. As decided by the Supreme Court in the recent Minneci v. Pollard case, inmates in private prisons cannot sue the state or the private prison corporation for abuses suffered in the prison. As all corporations seek to maximize profit and private prisons make money based upon the number of people imprisoned, private prisons corporations have lobbied politicians to increase the number of people in prison. The increased penalties for drug use, harsher illegal immigration consequences and three strikes laws are all example of how corporate lobbying has led to increased numbers of people imprisoned for a profit. Should anybody feel comfortable that corporations can infiltrate the justice system with their profit motive, and make money by imprisoning you, guilty or innocent? Where government is run like a business, money is made at the expense of the people who are least able to defend themselves from abuse. In addition to the differences in goals between government and corporations, governments must deal with massive free rider problems. Corporations operate on the simply principle that in order to get something, you must pay for it. Governments exist to support and protect all citizens, regardless of whether they can afford to pay taxes. When a government is run like a corporation, the poor and disabled are deemed freeloaders (Ex. reductions to welfare and disability) and cast aside by those in power in order to save money. Poor and middle class citizens benefit from government programs such as education and law enforcement while in a profit driven entity, they would be unable to afford such services. Private education and security services are available to those who can pay, but not at the price that we all pay through taxes. It is seen as a moral imperative to provide justice, defense and some basic services for the least of society. Unfortunately, it is very difficult to integrate a moral imperative into a purely amoral profit system, as these systems are based around making money rather than helping society. If profit overshadows equality and fairness as the goal of the government, the poor see their services cut, as they cannot pay for them. The reduction of education and the decrease in support leads to less upward economic mobility and creates a downward spiral. In public services such as law enforcement or the military, it is virtually impossible to integrate a profit motive without completely perverting the ideal of the institution. The military protects the country as a whole and should operate on these principles rather than a profit motive. We need only look at Blackwater (or whatever they are calling themselves this week) to see the end result of a for-profit military. For law enforcement, the major ideal is to promote social order, not make a profit. In addition to the issues already discussed, profitized police forces cannot enforce the law equally where the profit motive overshadows justice. If somebody does not pay taxes due to poverty the police must still protect them, a situation which demonstrates the textbook definition of the free-rider problem; a problem which is incompatible with the profit motive of businesses. 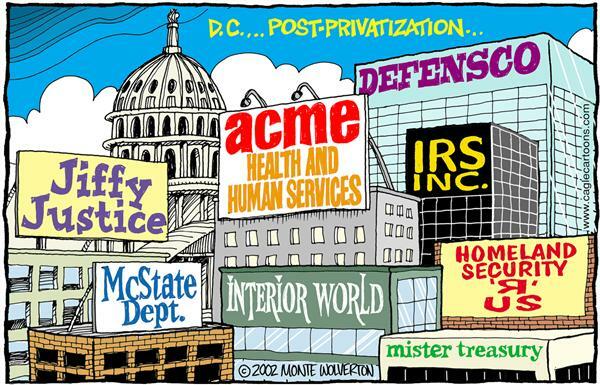 The next time you hear the term “running government like a business” you should understand what it entails. Reducing costs and services so that the rich no longer need to support the poor and perverting the goals of public institutions to save money rather than providing for society. There is an important reason that government and businesses are separate: Governments provide services for society and care little for making money, while businesses exist to make a profit, regardless of whether they fail to take care of those who cannot afford their services. These operating methods and ideologies are fundamentally different and thus should not cross over between the two types if entity.